Jamaican vocal trio, the Kingstonians were formed around 1966 by Cebert Bernard (aka Jackie Bernard) and his brother Lloyd "Footy" Bernard, along with mutual friend Lloyd Kerr. 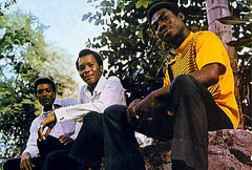 They began their recording career with producer J.J. Johnson (2), but had their greatest success between 1968 and 1970 with producer Derrick Harriott, who helped steer the singles "Singer Man" and "Sufferer" to the top of the Jamaican charts. An LP of the Harriott material was released in 1970 under the title Sufferer. The album was the career high point for the Kingstonians, who left Harriott to work briefly with producers Leslie Kong and Rupie Edwards before breaking up as the roots reggae era began. British pop/rock group Three Dog Night covered their "Singer Man" song in 1973.